While this isn’t directly mead related, I think there’s enough of an overlap in interest with cider that this can be relevant. At least in the US, cider has also recently been promoted from an overlooked beverage, in a similar manner as mead. 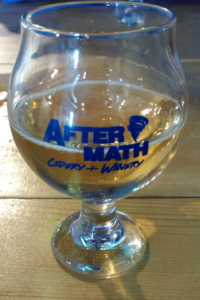 I recently visited Aftermath Cidery & Winery in downtown Valparaiso, Indiana. They had recently moved to this new location a few months back. It has a cozy interior with a long bar on one side and tables lining the wall of the other. Intimate but still spacious. They serve a solid variety of flavors, with a stable core and a rotating selection of seasonals. You can order by the glass, a flight of 5, or have a growler filled. On top of that they also have a decent sized food menu which I’ve heard good things about, but did not have the opportunity to sample on my visit. On my visit, I had a flight before choosing my favorite for a glass. My girlfriend and I ultimately decided to have a growler filled of the Butterbeer. It was quite tasty, and there only being 2 kegs left until the flavor returns in July helped to make that decision. All of the varieties I tried were on the sweeter end of the spectrum, and were very good. I was not able to try their drier or semi varieties but I have no doubt they were also very drinkable given the quality of the ones I did have. This turned out to be my favorite this trip, and was what I bought a full glass of. It was sweet, but not in a cloying, overpowering sort of way. Nice, smooth maple flavoring that mixed nicely with the apple. This was another one of my favorites. I had recently been trying to finish up my own cranberry mead, so was very interested in how this cider tasted. Cranberry and apple always go well together. It seems most non-100% cranberry juices out there have apple as a base to begin with. The cranberry adds a nice bite to the drink, while the apple brings a nice sweetness to it. This one, I am sure, is one of their most popular flavors. I’ve had a few different butterbeer recreations before, and my favorites are always the cider-based ones. This had a prominent butterscotch flavor, was sweet but not overpowering, and the cider base gives it that slight crispness. My girlfriend got a glass of this after we finished sampling the flight, and we also had the growler filled. I’d recommend trying it if you have the chance. This was the most subtle of the flavors that I tried. The hint of almond is faint, but pleasant. It’s a nice apple flavor upfront, and you get the almond as you’re swallowing it. For those of you who aren’t big cider fans, this one might be up your alley. It was more reminiscent of a lemonade, in my opinion, than a cider. Had the hallmark sweetness with a bit of sour. Still very good.